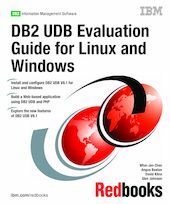 You ask yourself, "So I have downloaded DB2 UDB Version 8 for Linux or Windows. What's next?" This IBM Redbooks publication helps you journey through the experiences of discovering the new DB2 UDB V8.1. This journey introduces you to existing features and enhancements that make the DB2 family of products a superb choice for a relational database. We start out by showing you how to install DB2 in both the Linux and Windows environments. Next, we introduce you to the graphical DB2 tools, enabling you to become productive more quickly. Once familiarized with DB2, we gear you up for the Internet by providing a dynamic PHP Web application to manage a book store through a DB2 database. This provides a foundation for developing applications with DB2. Building on the Web application, we describe, in detail, all of the DB2 application development features and the programming languages supported. For the database administrator, the autonomic capabilities of DB2 UDB Version 8.1 act as your 24x7 assistant. We fully cover the database administration functions of DB2 including database configuration, support and monitoring tools, and wizards. Finally, we provide DB2 product information, a selection guide, and a roadmap to help you become a DB2 certified professional.